WWE has announced that Chloe x Halle, the sister duo signed to Beyoncé’s Parkwood Entertainment, will perform “America the Beautiful,” kicking off WrestleMania 34 on Sunday, April 8, at the Mercedes-Benz Superdome in New Orleans and streaming live around the world on WWE Network at 7 ET/4 PT. Chloe x Halle rose to fame after their rendition of Beyoncé’s own “Pretty Hurts” caught the attention of the mogul’s Parkwood Entertainment imprint and signed them in 2014. 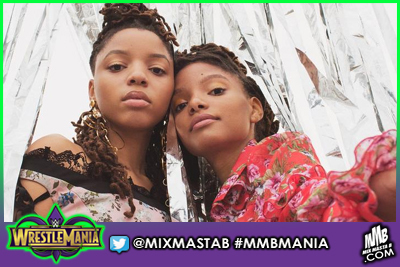 Since then, Chloe x Halle have garnered millions of views around the world on their self-titled YouTube channel, been featured on Michelle Obama's charity single, "This Is for My Girls," with Kelly Clarkson, Missy Elliott, Kelly Rowland and Janelle Monae, appeared in Beyoncé’s visual tour de force, Lemonade, and released The Two of Us, brand new music mostly written and produced by the duo.